A healthy mix of first time All-Stars and savvy veterans comprise this year’s All-Star Rosters. With the teams finalized, what can we expect from Saturday’s superstar-laden contest? This year, the WNBA All-Star teams were more in the fans’ hands than ever before. With fans having the ability to vote any player into the starting lineup, it was hard to predict exactly who would be chosen. But after the votes were tallied, the league ended up with a bevy of familiar faces in the starting lineup; each of the All-Star Game starters have been selected in at least one previous game. Additionally, this year’s game will be the first in four years in which a rookie was not chosen as a starter, after Maya Moore’s selection in 2011, Elena Delle Donne and Brittney Griner’s in 2013, and Shoni Schimmel last year. Predictably, all the previous names are present again this year, along with several other veterans who were chosen by coaches around the league as reserves. Despite the heavy experience in the starting lineups, head coaches have obviously been impressed with some of the league’s younger players having breakout seasons. Seven first-time All-Stars will take the court at Mohegan Sun Arena on Saturday. The two new selections from the Western Conference may have never been All-Stars, but they both have enough hardware to make up for it. 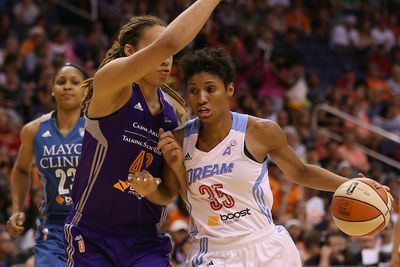 Mercury forward DeWanna Bonner and Shock frontcourt player Plenette Pierson are both two-time WNBA champions and former Sixth Woman of the Year winners, with Bonner having won the award three times. The Eastern Conference boasts five new faces on the All-Star team this year. The top two leading scorers from the fourth-place Connecticut Sun were selected in Alex Bentley and Kelsey Bone. Bentley is one of the best defensive players in the league, leading the WNBA with 37 total steals, while Bone’s inside scoring ability has led her to the best field goal percentage in the league. The Mystics’ frontcourt tandem of Emma Meesseman and Stefanie Dolson are also making their first appearance in the All-Star game. Much has been made of the duo’s ability to elevate one another’s play over the course of the season, and for good reason. They’re the Mystics’ leading scorers as well as rebounders, and they both rank in the top 10 of the league in PER. Marissa Coleman of the Indiana Fever rounds out the new reserves from the East, whose three-point shooting will help balance out the bench attack from the Eastern All-Stars. She’s made 22 threes this year, good for eighth in the league, and is tied for ninth in steals with the same number. The West will attempt to balance the youth of the Eastern Conference reserves with the experience of seasoned veterans. The bench is comprised of WNBA legend Sue Bird, Los Angeles Sparks center Nneka Ogwumike, Minnesota Lynx guard Lindsay Whalen (injured), and San Antonio Stars guard Danielle Robinson. Bird and Whalen are two of the best distributors in the league, while Robinson and Ogwumike will be playing in their third consecutive All-Star Game. Though the West has an edge on the All-Star game record historically, it’s been even matchup since 2009, with both conferences taking two contests. Last year’s matchup ended with an Eastern Conference overtime win after Tamika Catchings’ layup put the East ahead with 6.9 seconds remaining. Skylar Diggins — who will miss this year’s contest with a torn ACL — had a chance to win the game for the West, but Catchings knocked the ball from her possession before she had an opportunity to threaten the victory with a shot. The 2015 All-Star Game should be just as entertaining. Tamika Catchings returns to the starting lineup this year, and with Elena Delle Donne and Angel McCoughtry, the East starters boast the league’s leading scorers, and their offensive versatility should test the West’s defensive skills. Moreover, even though Shoni Schimmel has not played a significant role in the Dream’s offense this season, she’s shown she has the ability to rise to the occasion on the biggest stages. The East should have their own matchup problems dealing with the West’s starting frontcourt, who happen also to be the starting frontcourt for the Phoenix Mercury. Brittney Griner and Candice Dupree present a tough task for McCoughtry and Liberty center Tina Charles. Chemistry could’ve benefited the West even more, as Minnesota’s superstar tandem of Seimone Augustus and Maya Moore were voted starters — and are the Lynx’s leading scorers. But Augustus is out with a knee injury. Though the rosters had been announced on Tuesday, they were not yet final. Replacement players were to be assigned by WNBA President Laurel Richie for the players inactive due to injury. She selected Kayla McBride (San Antonio Stars), Jantel Lavender (Los Angeles Sparks) and Riquna Williams (Tulsa Shock). Now with them being set, any subsequent changes to the starting lineup will be made by the team’s coaches. Chicago Sky coach Pokey Chatman will handle head coaching duties for the East, with Mercury coach Sandy Brondello assuming the mantle for the West, prizes for winning their respective conference titles during the 2014 season.